Jing Qu, an 18-year-old high school senior, explains why she started a consciousness-raising group on campus. In April of this year, prompted by a letter to the student newspaper, my high school became the subject of a wave of media coverage about female leadership on campus. Although the conversation about gender and leadership had been started – as the New York Times noted, in 40 years as a coed institution only four women had ever been elected student body president -- the discussion polarized the campus. It was with that in mind that two faculty advisors decided to organize a sleepover for students. With senior girls as hosts, the sleepover would be a safe place where we could ask questions about gender, share experiences of sexism, and inspire each to speak up. 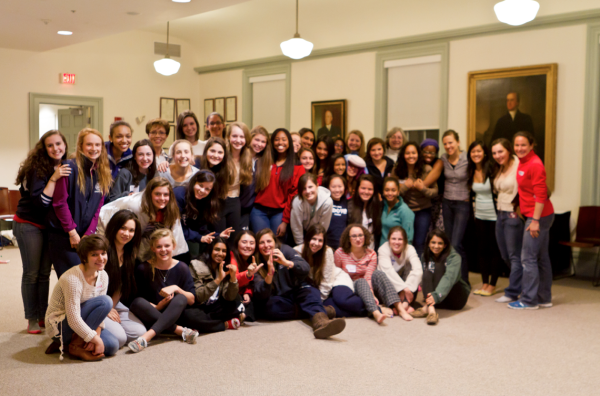 Four years prior, as a freshman, I’d attended a similar sleepover – organized by the same faculty advisors. This time, I was the mentor. Although we hadn’t heard of Lean In Circles at the time, the sleepover, centered around empowerment, was essentially our version of what would become one. We seniors arrived first to set up and were nervous about the younger girls’ arrival. What if they didn’t have fun? What if they hated the topics at hand? My worries set aside when we sat down to watch the Ted Talk given by Sheryl Sandberg. As Sheryl talked about the lack of female leadership nearly everywhere in the world, I sensed a change in many of my younger counterparts. In between bowls of ice cream sundaes, we took turns sharing our experiences, and I listened to girl after girl talk about a time when gender has held her back or given her different expectations in the classroom or in a social atmosphere. We dressed up in animal hats and rainbow scarves during an exercise in improvisation. We talked about the notion that women can’t be funny. We listened to problems and brainstormed solutions – until Ms. Sykes, our faculty advisor, told us that midnight was bedtime. The trade-off for allowing the sleepover was assuring the house counselors that we would actually get some sleep. Many talk about the gender gap as an outdated issue, especially in a privileged school with progressive ideals. Though we don’t have to find jobs or earn wages, we are interacting with other girls and boys, forming the basis of societal norms that will affect us when we leave the confines of school. Leaning in needs to start before we enter the workforce and even college. I am a feminist, and I reckon many girls became one too after the sleepover. Host: Phillips Academy, a private high school in Andover, Mass. Where The Circle Took Place: The Brace Center for Gender Studies, which was part of Abbot Academy, Phillips Academy’s sister school before the two schools merged in 1973. As the place where so many women had studied before, the Brace Center, with its big multi-purpose School Room, seemed like the perfect spot for a sleepover. Circle Fuel: Ice cream sundaes, fruit, cereal and bagels. Goals: As a senior, I wanted sophomore girls to be given a chance to reflect on their experiences as girls and realize that their aspirations are not impossible and that there are other ambitious girls to draw support and inspiration from. Most Surprising Moment: How fast time went! We worried that our activities—an icebreaker identities game, improvisation exercise, TED Talk, discussion and snack break—wouldn’t take up enough time. But in the end, we were rushing to get to everything done! How Late the Circle Went On: Lights out was around midnight, but the room was large, so there’s no guarantee that everyone went straight to sleep! Advice to High School Students Who Want to Lean In: Find others who care about and are passionate about the same causes you care about. Find others who are motivated and hardworking. Not only will you help yourselves in your respective lives, collectively, you can do more to help your school move towards greater equality!